Why Choose Gene Brown's for Transmission Repair in San Antonio? We specialize in providing quality transmission repair San Antonio. We also provide quality transmission rebuild San Antonio services along with transmission rebuilds. Whether your car has an automatic or manual transmission, fluid leakage or slipping gears, we offer diagnosis and transmission repair for a quick and easy fix. 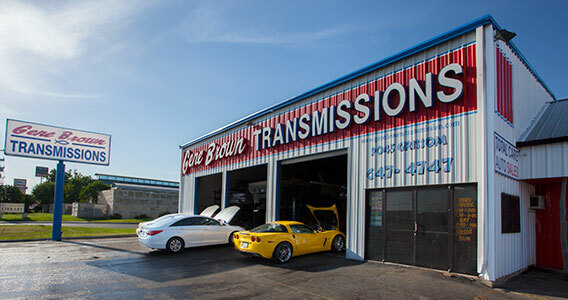 The employees at Gene Brown’s Transmission in San Antonio, TX are trained to quickly spot any problems with your transmission as well as repair them for the best transmission repair in San Antonio. We even do foreign transmission repair. Transmission repair San Antonio doesn’t mean you will have to give up quality. Quality is is our top priority. What Are Some Transmission Repair Symptoms? When anything feels different or incorrect with your car and you are in the San Antonio area, do not hesitate to call us and have us take a look at your vehicle. An inspection by the professionals at Gene Brown’s is priceless when it brings peace of mind. Beware of Cheap Transmission Repair in San Antonio. What Are Some Transmission Repair Solutions? Is there a difference between discount transmission repair San Antonio vs other options? There are many potential issues that a vehicle’s transmission can face. Inevitably, there are multiple solutions which we can utilize to get your ride running smoothly. Our technicians have the ability to repair most troubles with a minor adjustment or repair. The most common repair job is a reseal, which is used to stop any fluid leakage. Many parts can be replaced with relative ease, helping to save you money. By replacing these parts, we can avoid a complete rebuild to fix the issue, saving you both time and money. We also offer transmission flush. We also offer transmission rebuilds at a very practical price. Sometimes a minor solution such as simply sealing or replacing a few parts is not possible, but we possess the skill to solve the problem without requiring you to purchase a brand new transmission. Our experts can take your transmission apart, add new or better parts, and entirely rebuild it as good as new. This spares you the cost of buying a replacement all while granting the quality of a brand new transmission. A completely rebuilt transmission is often the way to go. Do You Need A Transmission Replacement? When a repair or rebuild does not suffice, and your transmission is irreparable, we are able to replace your wrecked scrap for a brand new one. We take genuine care of ordering the correct parts and model to ensure the fresh transmission is optimal for your specific vehicle. With our many convenient locations around the San Antonio area and unmatched customer service, we are able to make sure you and your vehicle are treated with quality service at a quality price. Don’t hesitate to call us at 210-647-4747 for your repair needs.